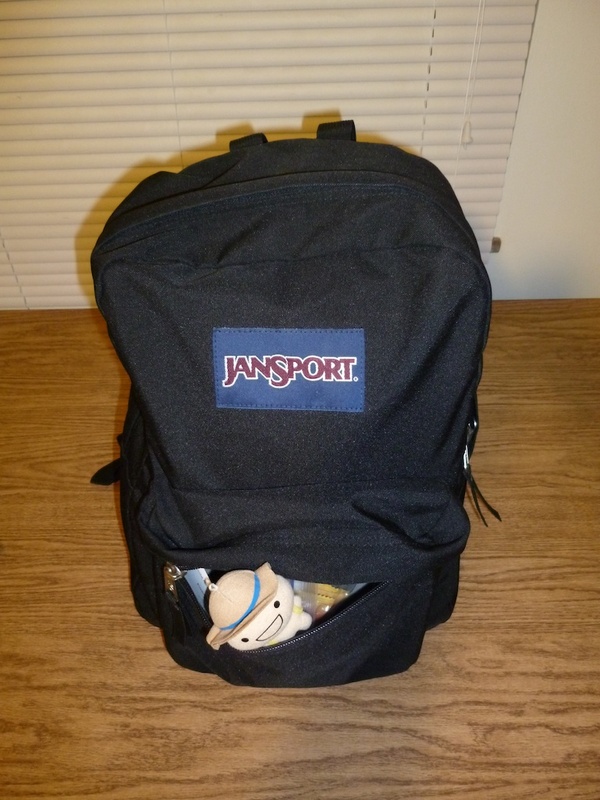 When I flew to Atlanta for Dragon*Con 2011 this past weekend, I only carried a regular sized two pocket JanSport school backpack [pictured above]. Like many other folks, I have discovered the joy of lightweight traveling. As Y and I discovered during our trip to Europe over the Summer, carrying fewer things makes travel a lot easier and less stressful. In order to succeed at lightweight travel, you have to critically evaluate your travel needs and plan ahead for ways in which you can reuse, repurpose, and clean your things on the go. This is what I fit into the JanSport: two days of clothes, toiletries, 13″ MacBook, iPhone, compact digital camera, chargers, snacks, travel documents, and Mr. Bread (for photos). For the trip to Atlanta, I knew that I would be staying there for two days, so I had to bring enough clothes for that. I wore a polo shirt, Lucky jeans, and Teva hiking shoes on the trip down. Despite the heat, I knew that a nice pair of jeans are a great all-purpose and all-setting garment. Also, I needed my laptop for the SFRA panel on Sunday and a camera for the parade on Saturday. This meant that I also needed chargers for my laptop and camera batteries. I knew that I would bring my iPhone, but that doesn’t necessarily need its own charger–only a USB adapter to connect it to my MacBook for recharging. In addition to traveling light, it is smart to organize your things so that you don’t have to hunt for things on the road. I used a clothes washing bag to hold two polo shirts, underwear, and socks. I used another bag to hold electronic support gear (screen wipe, camera lens cleaning pen, chargers, thumb drive). My MacBook went into its own neoprene sleeve, which also carried my travel documents. Liquids went into a quart ziplock bag, and my other toiletries went into a small zip-up bag. The types of bags that I employed did require a little extra weight, but the sizes and colors allowed me to immediately recognize what bag held what things. Grocery bags and ziplock bags would work if you are weight conscious. Having only the backpack of things to carry around meant that I could easily board the puddle-jumper aircraft that I knew that I would be flying without having to gate check anything. Also, a backpack fits easily underneath the seat in front of you, which means that you can easily grab things without having to hunt through the overhead bins. Also, I knew that I would have to check out of my hotel before the SFRA panel on Sunday, so I didn’t want to have to carry a roller bag through the 40,000+ crowds at Dragon*Con. I am very pleased with my single backpack traveling experience to Atlanta. The con was certainly stressful enough for me, so having one less thing to worry about made me more relaxed. Considering it from another perspective, my choice to travel with less things meant that I made a lower impact on the environmental costs of getting me from Ohio to Atlanta and back again. Less weight means less fuels/energy consumed by my car, by the aircraft, by the Marta train. Planning and organizing might save you some travel stress, too. And you can contribute to less pollution, too, especially if more of us choose to travel with fewer things that we probably don’t need to travel with anyways. Previous Post SFRA Panel at Dragon*Con Was a Success! Glad to hear this worked out for you. I packed for four weeks in England in a single carry-on sized suitcase (that converted into a backpack) & a carry-on garment bag. It was great. That’s awesome! Y and I did something similar when we were in Europe for three weeks for the SFRA conference in Poland. I had a Rick Steves carry-on size backpack, and Y had a similar backpack by Timbuk2. We did sink laundry in Poland and our friends in Switzerland had a washer/dryer that we used. 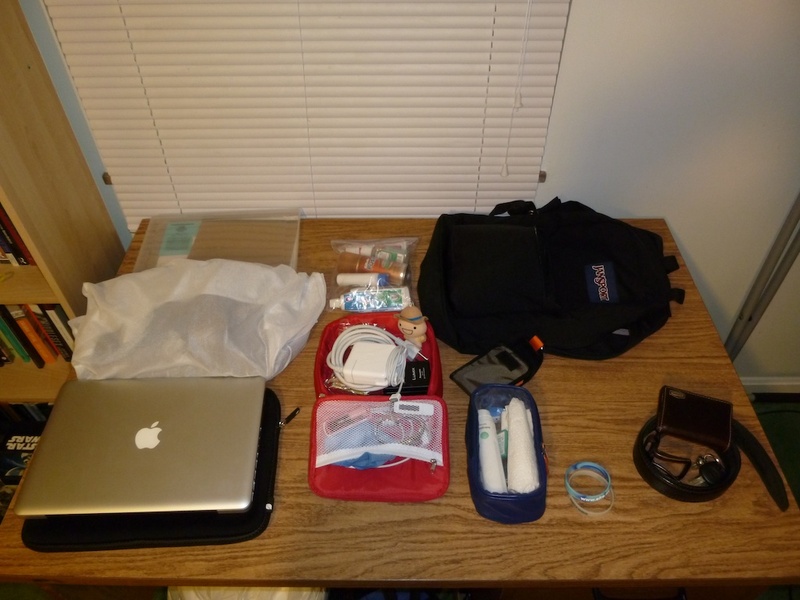 I used to follow my Boy Scout training–Always be prepared–when I prepared for a trip. That meant packing for lots of scenarios that were unlikely or improbable. I would double up on things or carry extra clothes that I might not even wear during the trip. Now, I like to think that I am prepared, but more reasonably so. I carry just enough clothes or a week’s worth, knowing that I can wash my clothes and keep on trucking.